This painting is titled "Comet". It's on paper, 65 x 44 inches. From this I will produce a line drawing of the painting, similar to other pairs on my website. If you go to www.michaelcrossgallery.com/jan2006webpage.htm you can see two versions of the painting "January 11, 2006": the "spontaneous" one and its line drawing. Trying to get a handle on what's known and not known by the artist when starting an abstraction. Doing the drawing afterward might uncover hidden patterns common to the body of work. Don't know. I'm curious, what artists, past and present, do you look at? Do you have anything in mind when you begin your paintings? 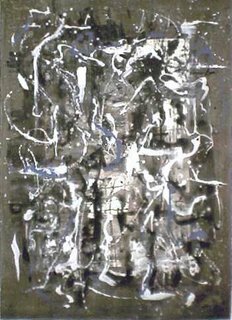 From the past, I look at Pollock, deKooning, and screen painting & calligraphy of the Japanese Edo Period and China's Qing Dynasty. From today's artists, I pay attention to Brice Marden, Louise Fishman, Richard Serra, Wenda Gu, Matthew Sondheimer, and Virgil Grotfeldt, among others. What I have in mind when I begin to work is a process: not so much WHAT the work will be, but HOW it will be made. The emphasis on technical process gives the analytical side of my personality something to do, allowing the creative side to work without too much interruption. I am a painter. That is very interesting about the process. I imagine it is a totally different way to work on a painting. Keep posting your work!